At the turn of the last century, nearly half of the American workforce was dedicated to agriculture. Industrial inventions like the steel plow had made farming easier, but it was still grueling labor performed by men, women, and work animals. The invention of the combustion engine changed all that. The mechanization of farm labor drove massive productivity gains, and today, agricultural workers make up just over 2% of the workforce. Now, another revolution is underway—the outright automation of farming. Farm robots are increasingly capable of autonomously performing complex tasks including plowing, plant and soil surveillance, and even the harvesting of fruit and vegetables. Clearly, these skills are also useful on the farm where many jobs have historically been beyond the average robot. Picking an apple, for example, requires visually examining an object that varies in shape and may be hidden in a chaotic canopy of leaves. Is it ripe? Workers must check for color and size. Whereas in the past, robots were ill-suited for such work—that is less the case now. 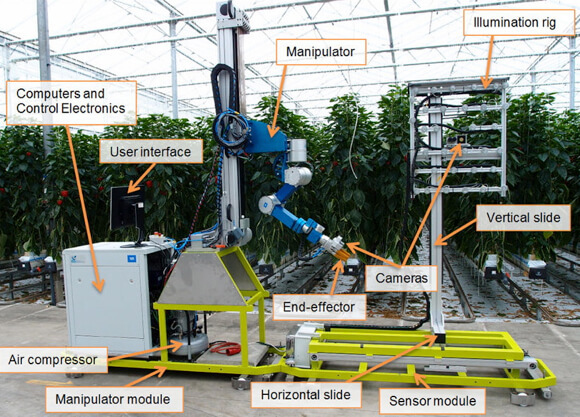 Computer vision, for example, is at the heart of the WP5 robotic pepper picker. 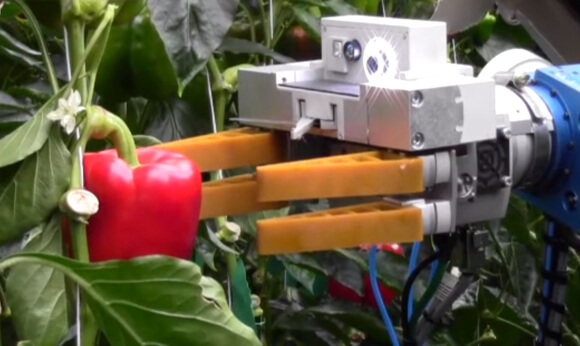 WP5 picks peppers in a greenhouse using a robotic arm equipped with a rubber gripper, two cameras, and a pair of clippers. The arm is attached to a moving apparatus that includes lighting, a compressor for the pneumatics, control electronics, sensors, and a computer to drive it all. The system was tested in April of this year in a commercial greenhouse and shown capable of autonomously harvesting ripe fruit. You might notice the robot is still pretty deliberate. The robot’s speed was slowed by researchers to avoid damage to the system and test its central functionality. But picking speed is ultimately the key to making the robot economical. Researchers estimate that a six second pick will be profitable when one robot costs less than €195,000 (presumably they’re not there yet) and lasts five years. Other needed improvements for more general farm use (outside controlled greenhouse environment) might include a more rugged platform for navigation. And while the rubber gripper appears soft enough to mold to the pepper (avoiding pressure points)—is it gentle enough for a ripe tomato? While it’s a great new demonstration, WP5 is hardly new or alone in the field of farm automation. The Autonomous Tractor Company, for example, is working to convince farmers they need self-driving tractors. Instead of GPS, it works on a local grid of ground-based transponders, radar, and a little preliminary machine learning (the farmer drives it around the perimeter). The technology is here—though, farmers have been slow to embrace it (in part because it is still fairly costly). Then there’s the Christophe Millot’s wine-bot, Wall-Ye. For $32,000, the robot autonomously trundles through vineyards pruning vines, testing soil, and keeping an eye on plant health. And Harvest Automation offers a bot that rolls around plant nurseries moving potted plants. All the nursery employees need to do is input the plant locations on a touchscreen. The robot takes care of the rest. Drones offer automated aerial solutions for farmers with large plots of land in need of monitoring. On autopilot from take-off to landing, these airborne bots image land to check up on irrigation problems, soil variation, pest and fungal issues, and plant health. Robots allow this to be done more consistently, cheaper, and at higher resolution than satellite imagery and cheaper than imaging by aircraft. Robots are best suited to tasks that are monotonous, dangerous, and repetitive. Long ago, they invaded the factory floor—it’s high time they made a foray into farm work.